Volcanic Drakes breathe lava instead of fire. The antacid vendor at Thorium Point does a brisk business with them. This card is very underrated in Egg Druid. It's not difficult to get this down to 3 mana or less. Having it dodge Dragonfire Potion is also a bonus. Look like it's time to make an Auchenai Deck again. It seems like he's mostly going to come out as a 4-drop, which means Piloted Shredder trades with it and still leaves a minion. It seems Brian Kibler spoke very highly of this. But it's not often to kill 3 or more minions friend or foe within 1 turn. You have to have many minions in your deck so that they can be on the board and trade, which rules out Priest Warrior and Druid. Playing it with 4 mana is typical. In that case it's better than 5/4, but still lost against Piloted Shredder. How? If anything paladin will with muster for battle turn three then this and possibly a one drop turn 4.
in a typical post dr boom turn, you can discount arround 3 mana ... specially it they killed it with bgh (run 2 boom bots in bgh) its 3 less or more depending on what has been layed on the board. 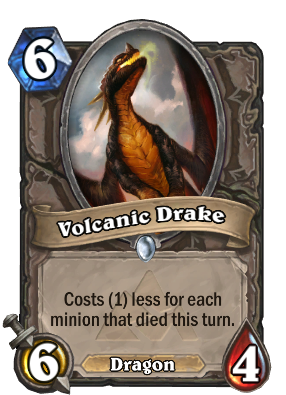 Flamestrike Dragon's Breath Dragon's Breath Volcanic Drake Volcanic Drake ???? Preposterous! Guys , it's actually a reasonable drop even for 5 mana. Considering the fact , that you are likely to trade ( even 1for1) you get insta value. Still , it's more like an arena card then constructed but only time will tell. this the potential to be insane if some dragon token deck is possible. Could see some play in warrior decks post brawl. To be played only after Board Clear. Then its great tempo. Awsome! It seems like the blackrock conept ( beside dragons) is tokens and free minions. This card is great combo with those tokens, as well as making them a double edged sword and a weakness to exploit by your opponent. 4 health is not op, but quick 6 attack is nice punishment, also, no bgh.